I am determined to get this posted before Ella's birthday month is over! 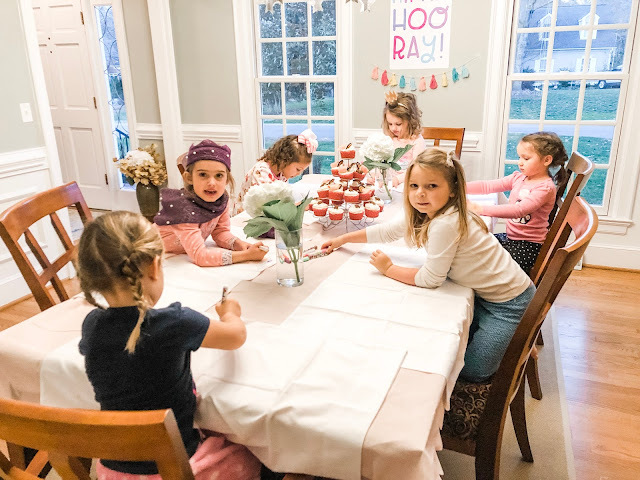 For her birthday party this year, Ella requested a sleepover! No way Jose was I having a bunch of 4 and 5 year olds spend the night at my house, so we turned it into a "pretend sleepover." Ella invited 5 of her best friends, and they came over at 5:30 PM in their pajamas. We made custom mini pizzas, decorated pillowcases, watched movies (or 20 minutes of one! ), opened presents, had cupcakes...and then when 7:30 rolled around, they all went home to sleep! It was honestly one of the easiest parties I've done and didn't even start decorating until the night before (whoops!). Ella really, really, REALLY wanted to have tents for her friends to "sleep" in! Luckily, I found a local mom on Facebook who rents them out! They barely fit in my car, but whatever. I added some fun battery-powered lights to make the tents even more festive. In our kitchen, we set up a "make your own pizza" station. The girls loved it! I took a picture of each girl making their pizza so I could remember whose was whose once we cooked them. 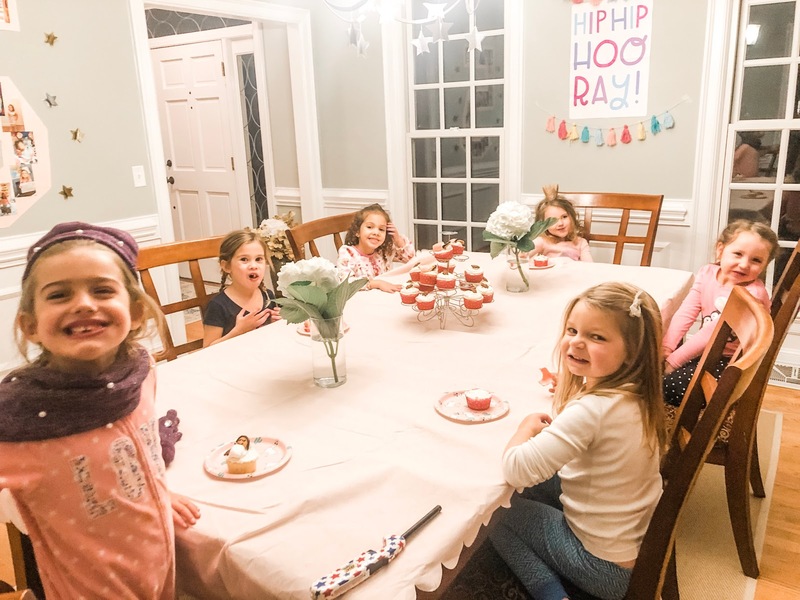 This is the ultimate sign that I really put no effort into this party: random plates and napkins from Target (that Ella chose, ha)! Anyway, once we were waiting for our pizzas to cook, the girls headed into the dining room to decorate pillowcases! 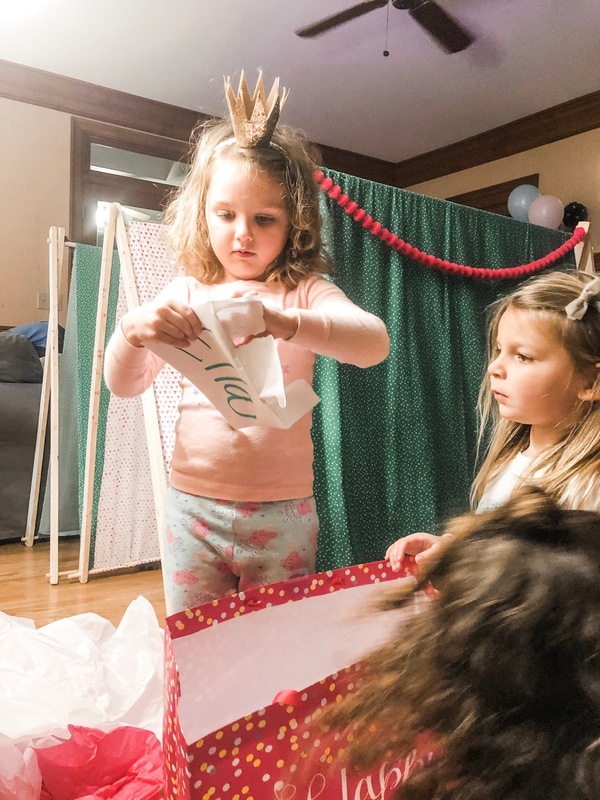 Because what other craft would you do at a pretend sleepover?! I found a bunch of white pillowcases on Amazon for super cheap, and then just picked up a big pack of fabric markers at our local craft store! ...it was time for cupcakes!!! I found these on (where else?!) Pinterest and they were surprisingly super easy to recreate!!! The girls all wanted to watch a movie, and chose "How the Grinch Stole Christmas." 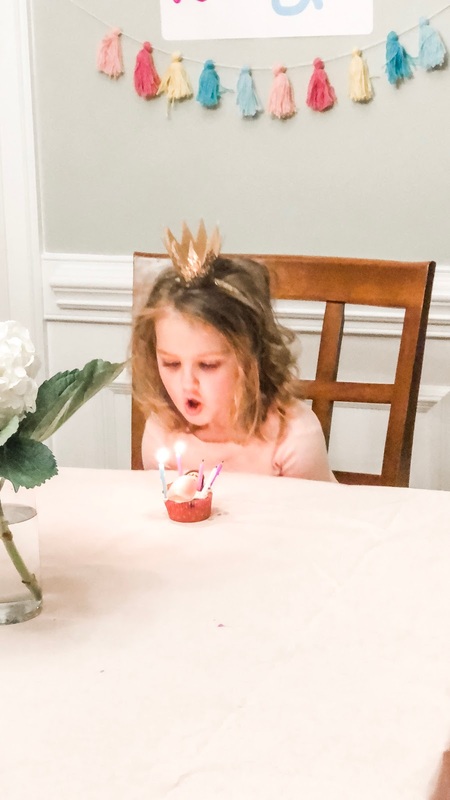 I mean, totally appropriate for a February birthday party! 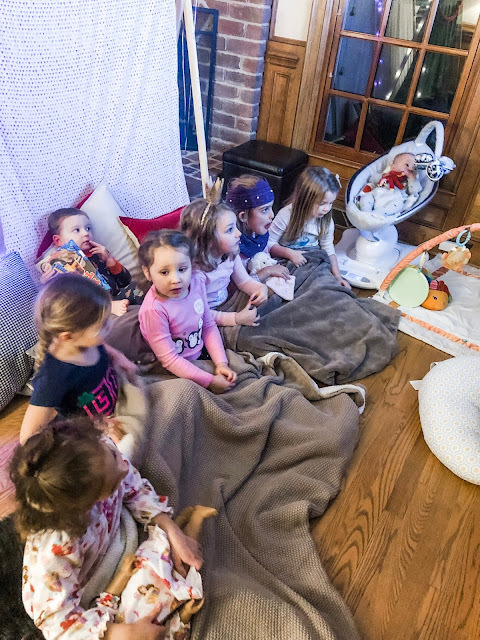 They couldn't see the movie from inside their tents, so they joined Lucas and Bennett in front of the TV. Everyone made it a solid 20 minutes into the movie before they wanted to open Ella's presents! So open the presents it was! Anyway, each girl got to take home a sleeping mask, fuzzy socks, nail polish and chapstick! 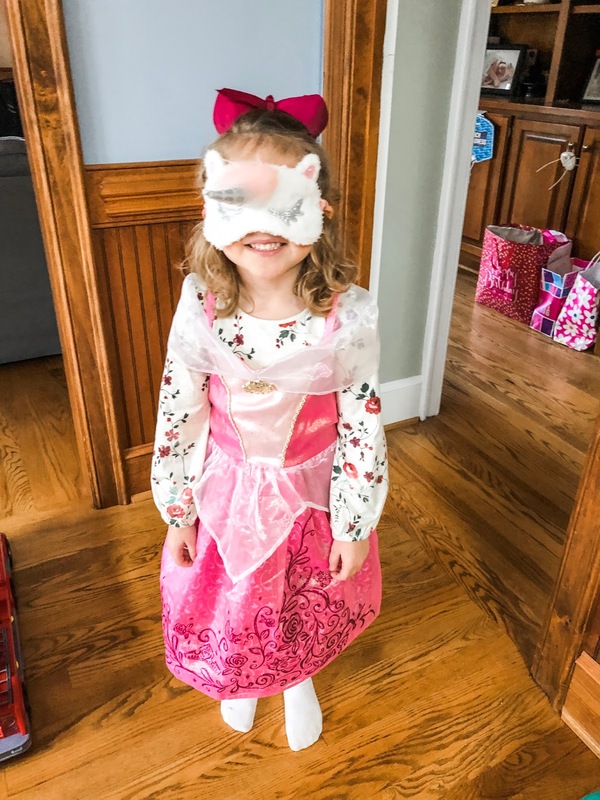 Ella is STILL obsessed with her sleep mask and wears it every night!! Today you are officially half a year old! 180 days! 6 months! How in the world is that possible?! 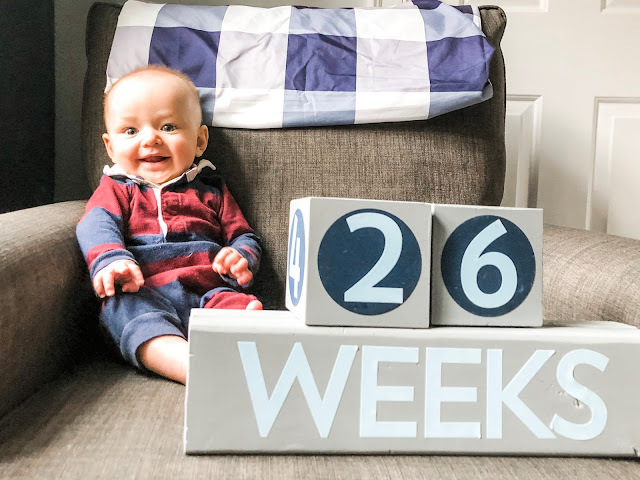 I honestly feel like you should only be 3 or 4 months right now, but nope! You are such a big boy!!! 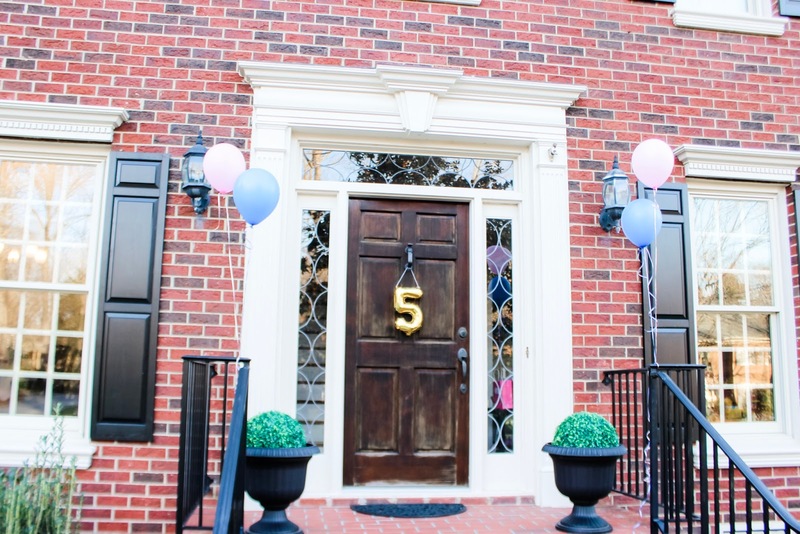 I can't believe we are already halfway to your first birthday! GAHHH! Time slow down!!! *We go to the doctor on Friday for your check up, so I'll update these stats then! 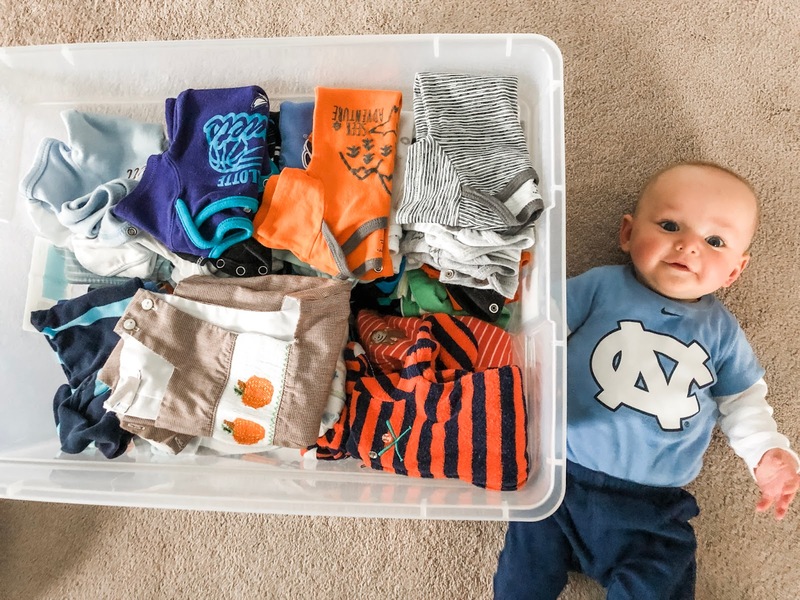 Clothes: You are in mostly 6 month stuff, with a few exceptions. 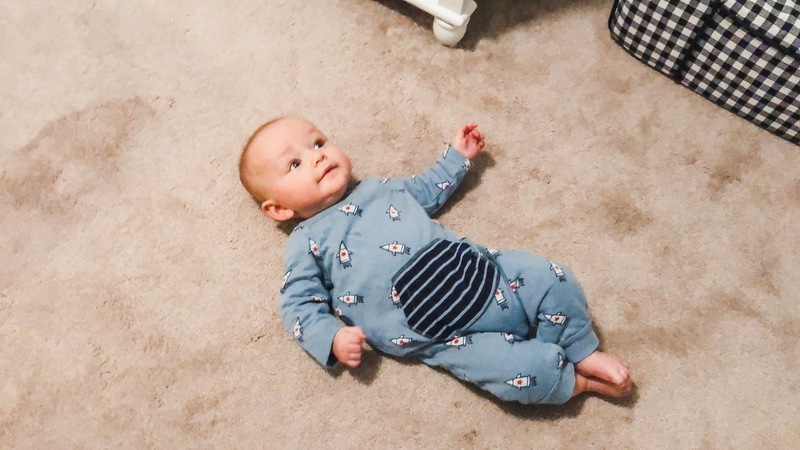 You can still fit in 3 month pajamas and 3 month onesies (like the one you are wearing in these pics is 3 months)! A few brands, like Kissy Kissy, run small and you can wear 9 months in those! You've moved up to size 2 diapers this month! Milestones: This was a big month for you!!! You sat up unassisted, and continue to get better and better at it every day! You also FINALLY rolled over!!! 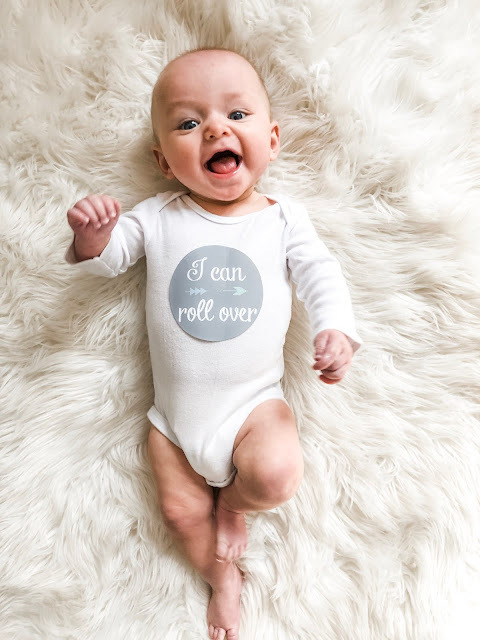 You are now a rolling machine and are SO proud of yourself every time you do it! You can also almost get up on all fours and you so badly want to crawl and get places! You are also trying to roll back to belly, and you get about 75% of the way there. You are just moving, moving, moving and have managed a few times to totally flip yourself around at night in your crib--no idea how, but you did! You are starting to stand up while holding onto things...you are pretty strong!!! You also love to "do crunches" in your Boppy lounger where you lift your head up super high off of it! I think you sleep great! Daddy, on the other hand, hears every little noise you make and apparently, these noises happen frequently! 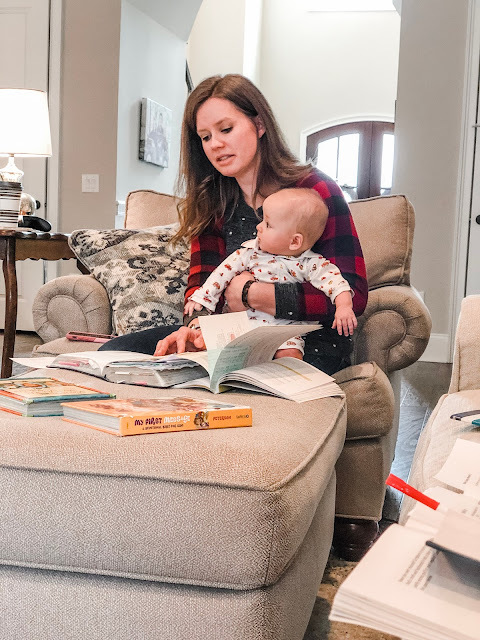 (Side note: pretty sure we are the only parents in America where the MOM sleeps through everything!) Here is the situation: you go down around 7:00 PM and I think you sleep until at least 5:00 or 5:30 AM. Daddy will say, "Oh, you didn't hear him at 1:00 and at 3:00?!" So whatever is going on, at least you're not fussing enough to wake me up and you go right back to sleep! Thank you for that! Best Moment: When you finally rolled!!! I was so excited, I literally screamed!!!! 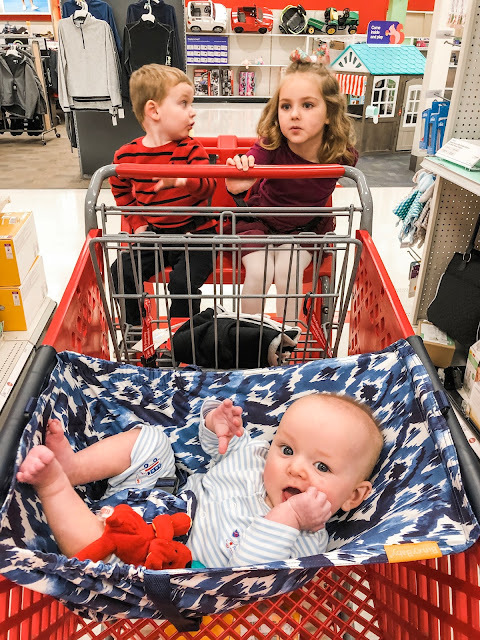 Worst Moment: Probably today when I made you take a picture in that basket (above). You freaking HATE that thing!!! I'm sorry buddy! But in all seriousness, I can't think of anything this month! We've had such a good time this month!! Likes: Your hands, eating rice cereal (I think? ), people people people (you are SO social! 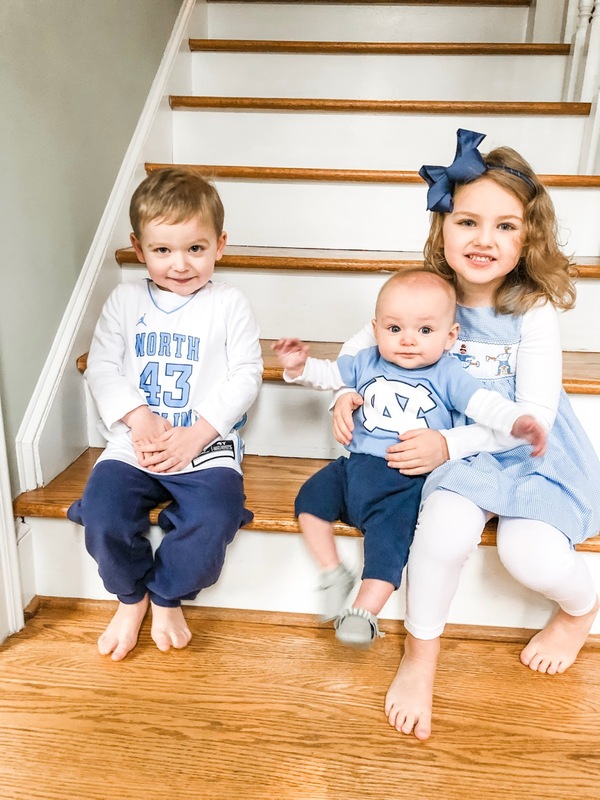 ), smiling at people, laughing at people, flirting with people, when people smile at you...kicking your legs, "swimming" in the bathtub, when your siblings make funny faces or sing to you, ceiling fans, being tickled under your neck. Dislikes: Well you're not mad often but... you did not like our large wicker basket and Mommy making you take pictures outside today! Ha! Also not a fan of being hungry, tired or cold (me either)! 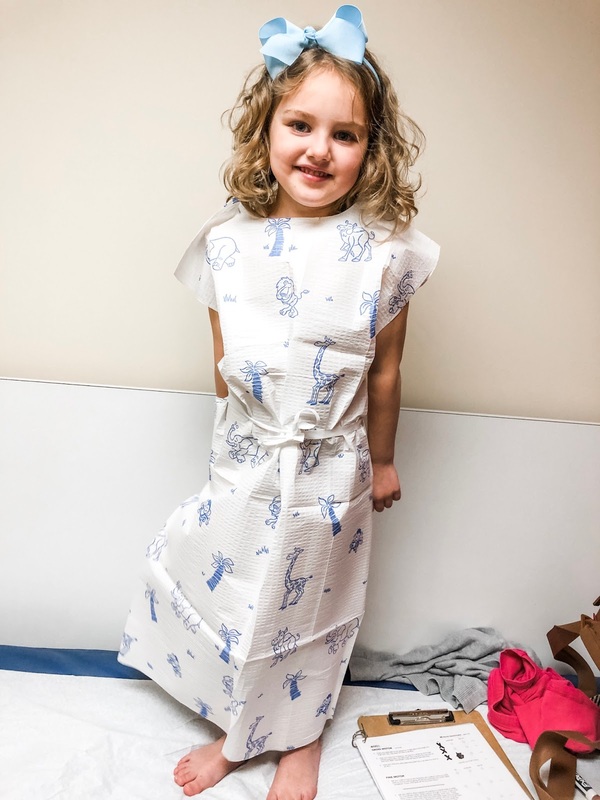 Health: I was terrified you might get sick with all of the germs floating around Charlotte right now, but (**knock on wood**) you have avoided all of the gross stuff for now! 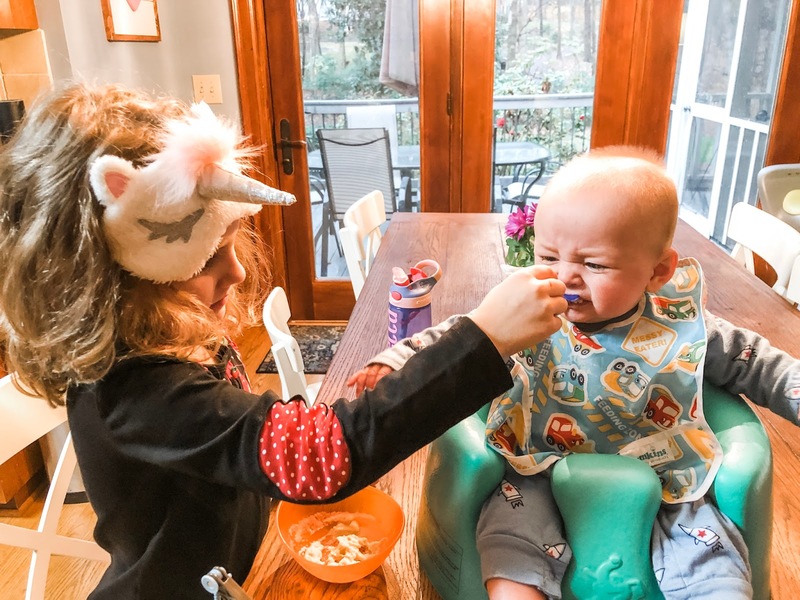 Eating: We finally got around to giving you rice cereal, and at first you absolutely HATED it! Like screaming, crying, the whole 9 yards. Then, Ella started feeding it to you and you started to like it! Now, you polish off a whole bowl! You still prefer your hands, but you will eat the rice cereal if it's offered! I'm excited to try real, yummier food with you soon! As for milk, you are still nursing every 3 hours and we do 6 feedings a day. You still won't take a bottle. You'd rather starve than drink out of that thing! Sweet little Ben Ben, how did we get so lucky?! You are the cutest, sweetest, happiest baby I've ever seen and we're so happy you're ours! Everyone always comments on what a doll you are! 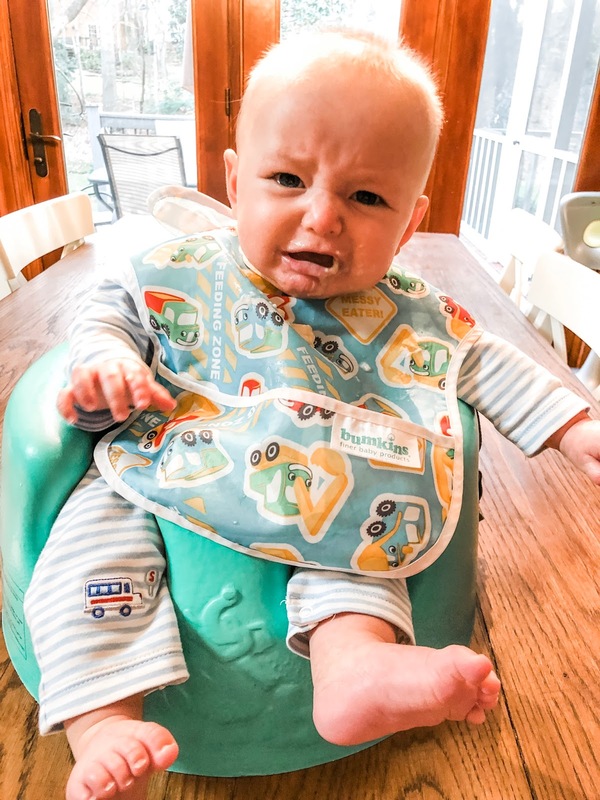 You are rarely mad or cranky...you are such a chill 3rd child! You love people and I think you might be my most social child! You love to smile at anyone and everyone who will give you the time of day! Now, just please stop growing. You can sleep, sit, laugh and eat...what else do you need to do?! Stay 6 months old forever! Happy Friday from the tropical rainforest of Charlotte! I seriously haven't seen the sun in I don't know how long! Can you believe we are halfway done with these weekly posts?! Ahhhh! This boy will be 6 months on Sunday and I just cannot handle it! This crazy boy is becoming more and more mobile. 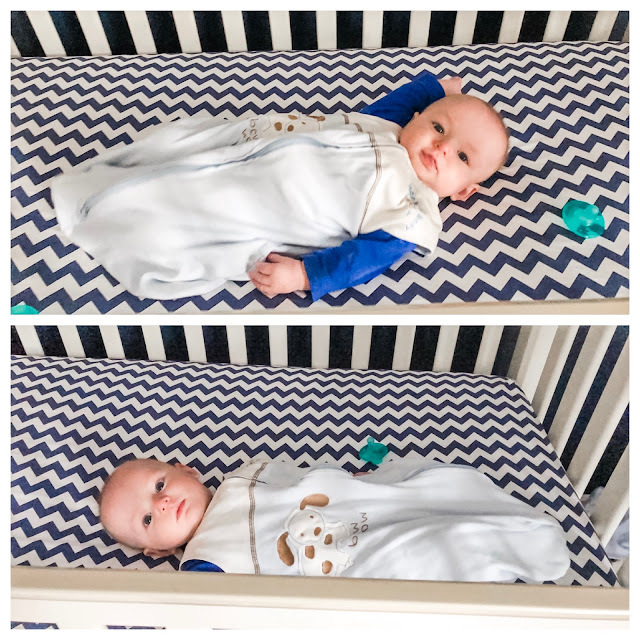 The top pic is how I put him to sleep Thursday night...and the bottom picture is how I found him Friday morning! I don't even know how he managed to do that! Friday morning, we had Ella's 5 year WELL visit. 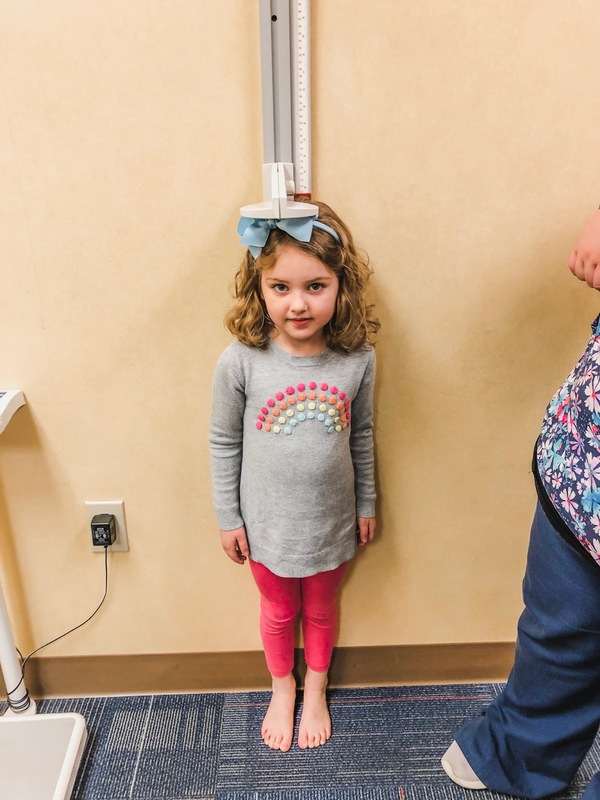 There are about 800 different germs floating around Charlotte (and I'm sure everywhere else) right now and I was SO terrified of going to the pediatrician's office! I made my kids promise they wouldn't touch ANYTHING and brought their tablets to keep them occupied, so they wouldn't touch the dirty toys and books in the waiting room. We all survived the germy office and this chick is just SO grown up! She's in the 60th percentile for height and the 70th percentile for weight, and was beyond excited to not have to get ANY shots at this visit! 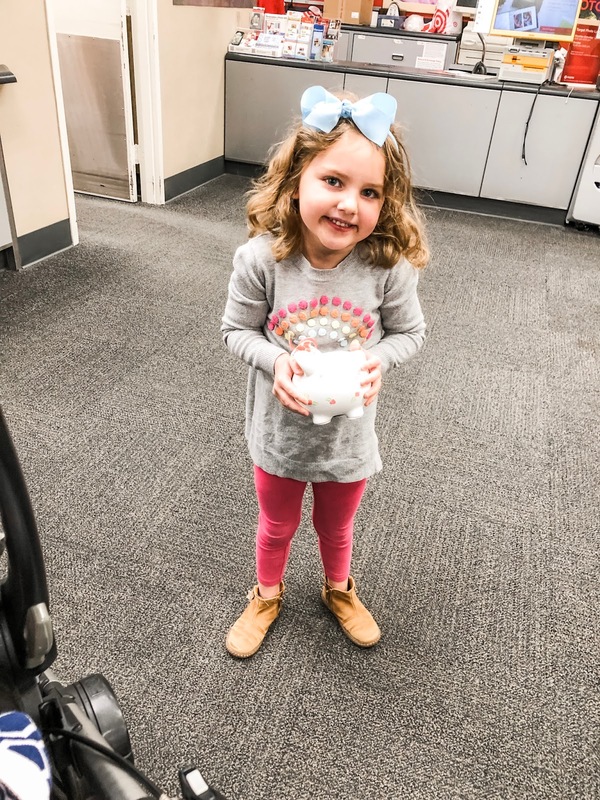 After the doctor, we decided to cash in her piggy bank money at Target! She had over $14 in quarters in there...thanks, grandparents! Ella and Lucas also got Target gift cards from Trav's parents for Valentine's Day, so I let them pick out some toys! Of course everything they got was Peppa Pig! Then Friday night...or should I say Saturday morning! We had to go to a party for All-Star Weekend. It was basically the most epic party I've ever been to. You all know Trav's work always does some pretty extreme Christmas parties....this blew those Christmas parties out of the water! It was INSANE! The party did not start until 10 PM and we didn't get home until 2:30 AM!!! I was paying for that all weekend! Yes, that's an entire Jordan shoe made out of fresh hydrangeas. They had a guy wearing some oxygen mask spraying the flowers with water (I think?) the entire party. It was pretty crazy. I'm glad I decided to wear a jumpsuit...because 90% of the ladies at this party also had on jumpsuits! Ha! That top layer was marshmallow and it was delicious (I only had 1 because I don't trust myself with drinks like this, ha!). So behind us/in front of us were more celebrities than I have ever seen in one place at one time! Except I didn't know half of them because I am not in the loop with athletes at all! But here's who I did see that I knew (there were tons more people there that I didn't actually see): Gayle King (yes, Oprah's bestie! ), Guy Fieri from the Food Network, Thomas Davis, Dre Bly (you probably wouldn't know him unless you're a diehard UNC football fan...Trav was ecstatic to see him! ), Mark Cuban, Spike Lee, Chris Tucker, Kevin Durant (he walked right in front of me as I was taking a video! ), Grant Hill, and then Travis Scott performed (couldn't tell you one of his songs, haha!). SO many famous people! It was seriously so epic and I'm only sad I didn't take more pictures! What's worse than parenting hungover? SINGLE parenting hungover! Trav had to work ALL weekend due to the All-Star game events (which, hats off to him for that because I have no clue how he managed! ), so I was left at home with all 3 kids. Yay. It took me a full 2 days to recover. I am no spring chicken, friends! 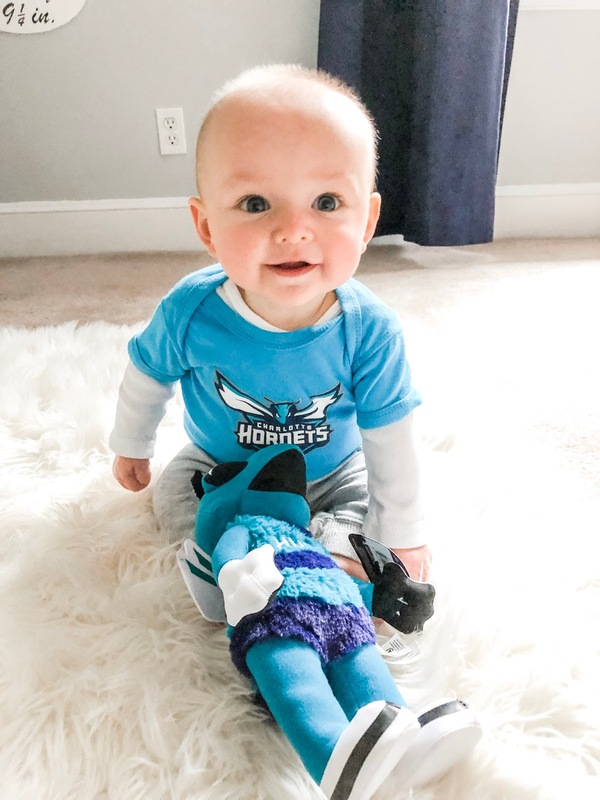 I took almost zero pics, but look at how cute Bennett is in his Hornets attire for the big game Sunday! 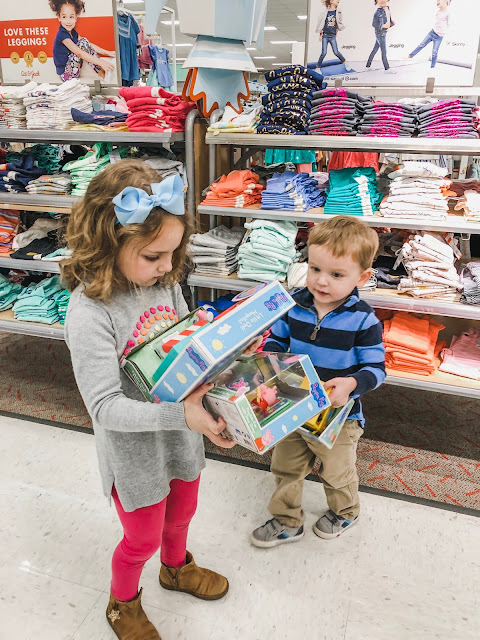 Ella was out of school for President's Day, so what better way to celebrate than go back to Target again?! 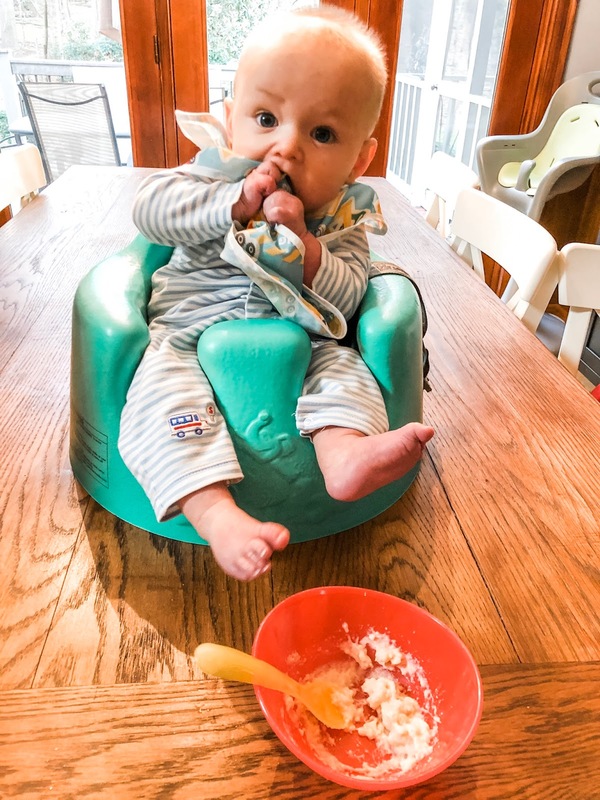 That evening, Bennett had his first rice cereal! 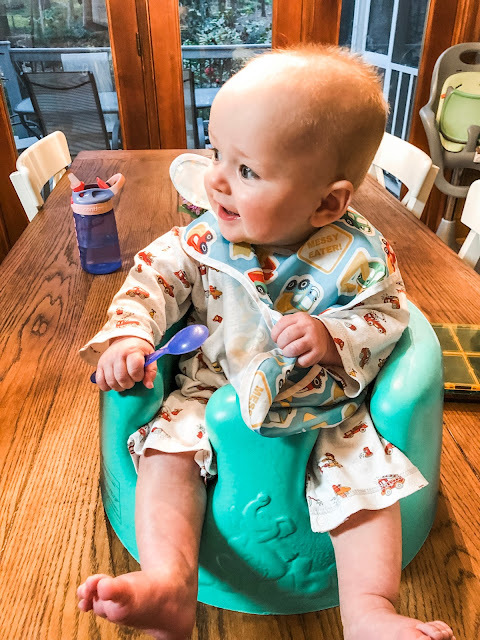 Now that Bennett is "eating," we will (eventually) move him to the high chair, which means Lucas gets moved to the booster seat at the actual kitchen table! He was so excited for his "new chair"! Bible study and grocery store trips. What's funny is that I couldn't tell you the last time Lucas was in Harris Teeter...I usually only go there on weekends when the kids are at home with Trav! 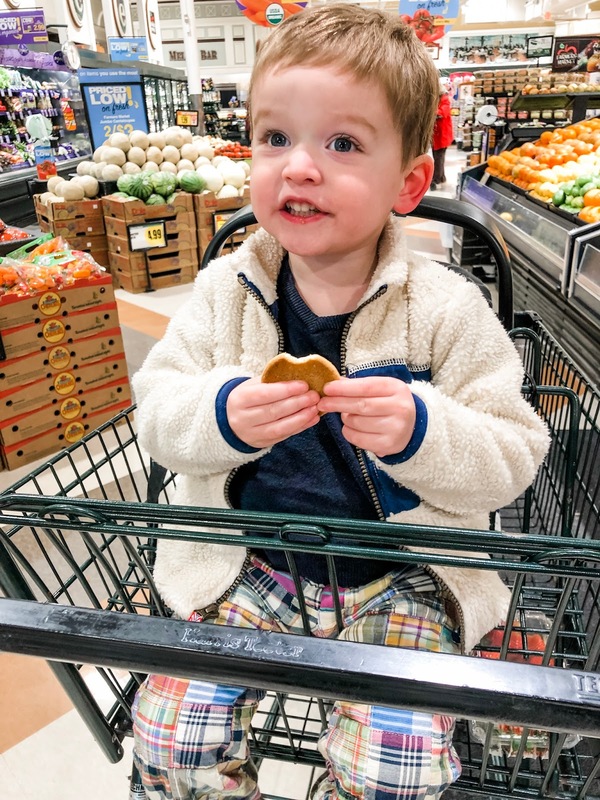 He was super excited about this cookie and now asks to go in to Harris Teeter every time we drive by. Also, on Tuesday, Bennett ROLLED OVER! Finally!!!! And Ella decided he might like the rice cereal if she fed it to him. He did not. Sporting our baby blue for the UNC vs Dook game! 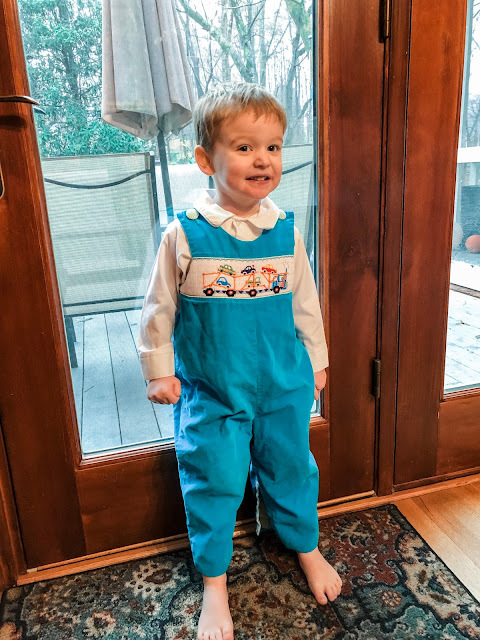 Bennett helped me sell a few of his old clothes! I can't think about it too much or it makes me really sad. And...is Lucas not a clone of Trav or what?! I'm not sure if you're aware but Lucas is OBSESSED with car transporters. Like, 110% obsessed. So when I saw this longall, I had to get it for him. 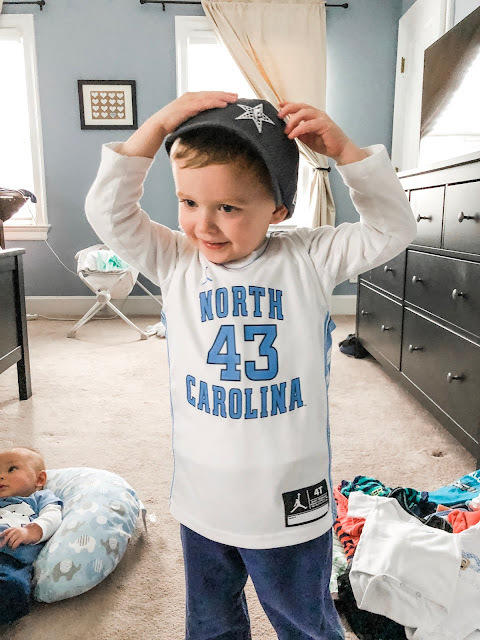 He was beyond excited to wear it! Bennett decided he wanted to help lead Bible study ;) He was waving and smiling at everyone while Ashley was sweet enough to hold him! And we made his rolling over official by taking a picture with the sticker on! 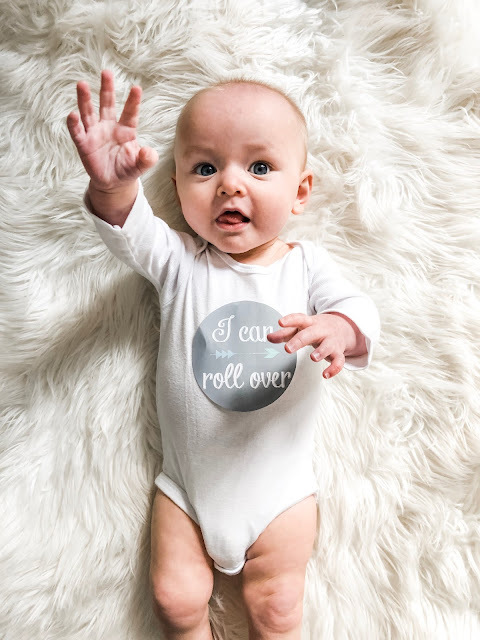 He's already working on that next milestone...waving! 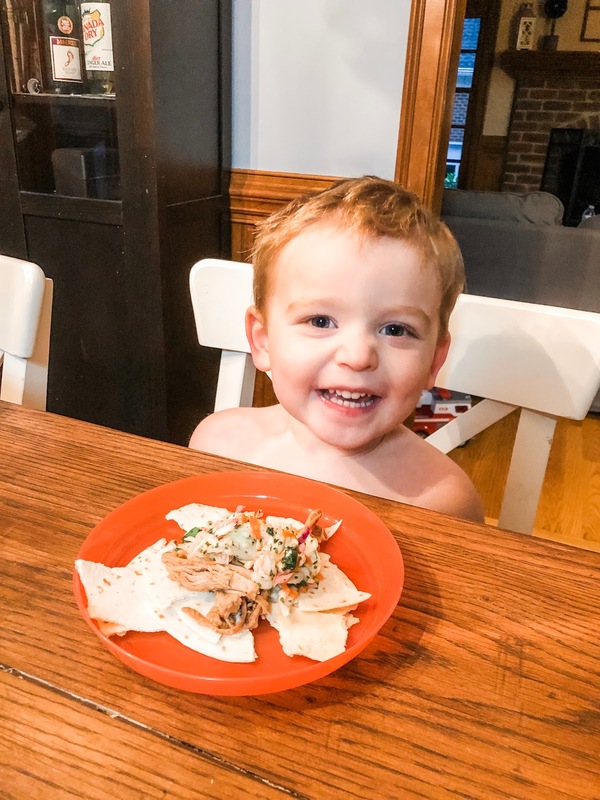 He's starting to warm up to the rice cereal...tonight he almost finished the whole bowl! Have a great weekend! Hope its nice and dry where you are!